When Stu Siegel, former CEO/Owner of the NHL’s Florida Panthers, realized they were not using tech or analytics to improve the way the hockey team was playing, he began digitizing and data-basing player data, sowing the seeds of what would later become HockeyTech. After acquiring other tech companies working in hockey analytics, Siegel began looking for a single space to house his growing staff and continue to develop new products – he chose Waterloo. One big reason to locate in Waterloo was more direct access to students from its post-secondary community. The University of Waterloo, for example, is home to Canada’s top-ranked Computer Science program and the world’s largest co-operative education program. Siegel also wanted more direct access to the University of Waterloo, where a number of professors were already researching hockey analytics and technology. “The University of Waterloo’s entrepreneurial spirit, not to mention its arena, opened literal doors to some pretty cool technology—and three years later, we’re still doing research and development there,” said Siegel. This partnership has led to the testing of multiple new technologies. One such test included embedding sensors in players’ equipment to track the position of every player at all times on the ice—creating millions of data points for analysis within a single game. 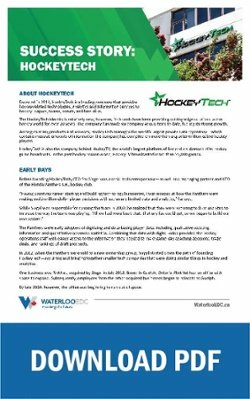 Siegel credits the local tech ecosystem as another reason for HockeyTech choosing Waterloo. 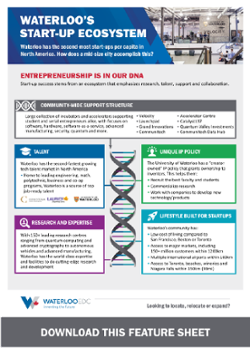 This ecosystem includes education and research assets like the University of Waterloo, as well as commercialization hubs like Communitech and Catalyst137, incubators like Velocity and the Accelerators Centre, and extensive peer-to-peer networks covering all aspects of tech business. With one of HockeyTech’s biggest acquisitions coming from Boston, a large percentage of Siegel’s employees are American. Moving to Waterloo had an unexpected benefit for his team. Waterloo was also helpful to HockeyTech’s bottom line, too. With lower cost of living comes lower salary requirements, less expensive office rates and more, giving Waterloo significant cost advantages. Want to grow in Waterloo? Contact us today!